What It’s About: North American bees cross-breed with Africanized honey bees from South America. Something causes them to form into huge swarms and decimate entire cities. Can entomologist Brad Crane (Michael Caine), who believes the bee has always been our friend, find a way to stop them? Why Watch it Today? : After years of scare mongering, including a sub-sub-genre of bee attack films, the “killer” bees finally invaded our shores on this date in 1990. 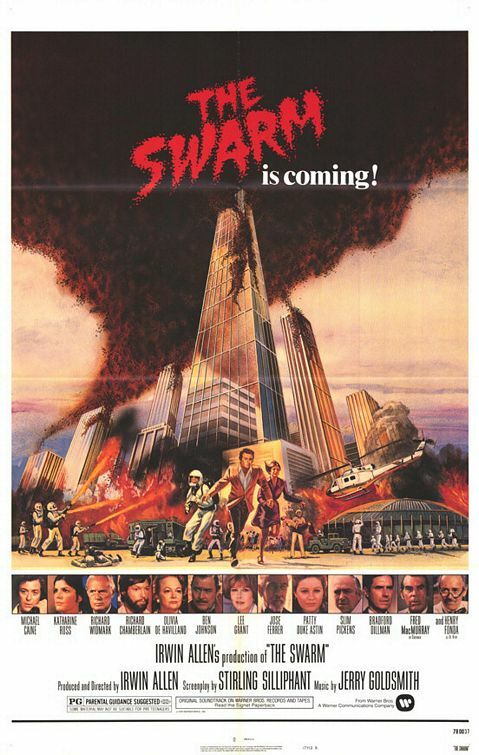 We’ve yet to see a disaster on the scale of this Irwin Allen film which just might be the zenith of the 70s run of Disaster films, with its outlandish premise, laughable dialogue, and cast of big stars. This entry was posted in Adaptation, Animals Attack, Based on a Book, Disaster, Ecological Disaster, Event Film, Horror, Movie of the Day, Sci-Fi, So-Bad-It's-Good, Thriller and tagged "A Galaxy of Stars", "Cast of Thousands", Allen, bees, Ben Johnson, Best Costume Design Nominee, Bradford Dillman, Cameron Mitchell, entomologist, flamethrowers, Fred MacMurray, Henry Fonda, Houston, Irwin, Jerry Goldsmith, Jose Ferrer, Katherine Ross, Lee Grant, Michael Caine, nuclear missile base, nuclear power plant, Olivia de Havilland, Patty Duke, Richard Chamberlain, Richard Widmark, scientists, Slim Pickens, Sterling Silliphant, Texas, U.S. Army. We survived that onslaught because THERE IS NO BEE! I need to see this again. It’s probably been 15 years, and back then I was less attuned to the glory that is a great Goldsmith score. Have to keep an eye out for it, Geelw.